Just about every pet owner ends up taking pictures of their chinchilla. And with the increasing popularity of digital cameras, it has become quite easy to do so. There's quite a difference between taking a picture and taking a GOOD picture. Questions about cuteness aside, there are a handful of technical issues that need to be addressed to get a quality photo. Here are the challenges that we've encountered and some of the ways we've addressed them. Chinchillas are crepuscular. They are most comfortable in a dark room. Of course, you can't see anything in a dark room. If you're like us, you probably settle on something in the middle of bright light and complete darkness. But dim lighting makes for poor picture taking. To get around this darkness, use a flash on your camera. The problem with most flashes on point-and-shoot cameras is that it points directly at the subject which often doesn't result in a pleasing photo. The better solution is to use a flash, if you can, that swivels so that you can point it towards the ceiling. This method will result in diffused light bouncing off the walls and ceiling to illuminate the room and your chinchilla in a much more natural way. Our chinchillas seem to know when we want to take pictures of them. They often won't sit still long enough for us to get a non-blurry shot. The trick for such situations is to make sure the shutter speed of your camera is set to the highest possible setting. A high shutter speed will freeze the action and also has the positive side-effect of eliminating blurriness from the movement of your hands. The exception to using a high shutter speed is when you actually want some blurriness so that movement is captured. For example, you might want to capture your chinchilla rolling around in the dust. Chinchillas like to tear up their environment. And they have great fun doing it. That's all great except when you want to take a picture. Ideally, you don't want the background to distract from the main attraction — your chinchilla. Now we're guessing that you're not going to set up a studio with a back drop so the alternative is to use your camera's functionality to blur the background. Take a look at the photo to the right. Notice how the background is all blurry and your eye is able to focus on the baby chinchilla? You do this by setting the aperture to its widest setting. Different cameras have different controls for this setting so you'll need to look in your camera's manual if you don't already know about aperture. And that's it. With the above three technical items covered, the creative part is up to you. We hope your chinchilla cooperates! I have 4 chinchillas and one of those just had 3 babies . This is her 4th litter all have been dead until now 1 lived in this litter . I have had to put papa in another cage so he wont eat the babies .I love all my babies and I think if you have time to groom them and give them the love they need they are great pets . I have 3 chinchillas and yes there are adorable. Photo Gallery, deffinitely would be awesome! I love chinchillas too.I have two a boy and a girl,bob and eve.Eve is getting realy big so i think shes going to have babys soon!!! 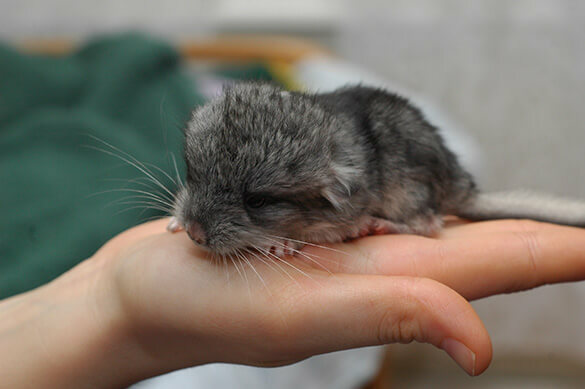 I just got a baby chinchilla. She is going to turn one very soon. I have taken dozens of pics of my chinchilla. I think it is a very good idea to have a picture gallery on your website. I would post pics.